No trip to Ashe County is complete without truly experiencing the Appalachian heritage which has been passed down through generations and is alive today. Bluegrass music has deep roots in these mountains, and locals can frequently find a banjo or dulcimer player pickin&#39; on a porch at one of the area&#39;s many antique general stores, just like the days when our mountain ancestors frequented these stores for their essential items for daily life. While these locations are well known and well attended by many, most pickin&#39; gathering spots are located down curvy mountain roads, in a holler, or in an area of the county in which visitors are not aware. Whether here for a weekend or a week, all travelers visit historic downtown West Jefferson, which offers a multitude of options for dining and shopping. On your next trip to West Jefferson, stop by a convenient location for enjoying an authentic Appalachian musical experience. 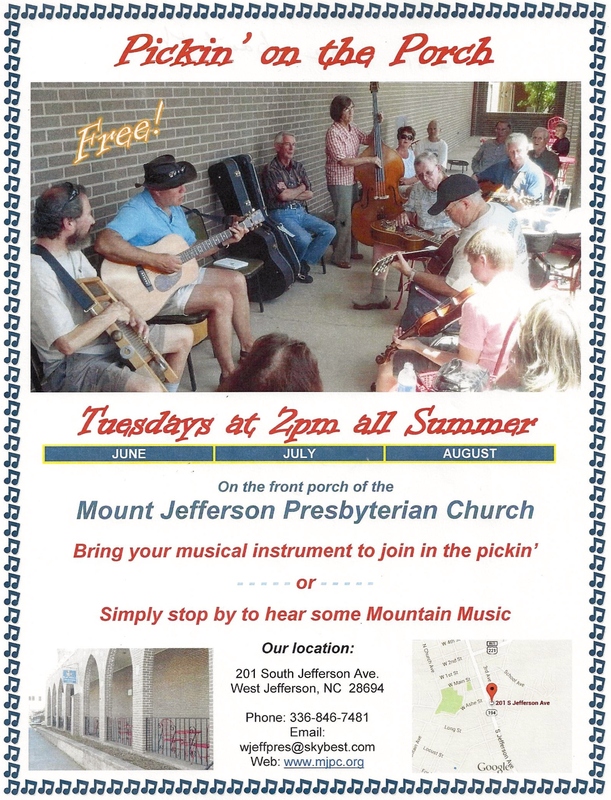 The front porch of Mount Jefferson Presbyterian Church is the site of &quot;Pickin&#39; on a Porch,&quot; a weekly gathering of professional and amateur musicians who make amazing mountain music together on their instruments. &nbsp;All are welcome to come and listen or bring their own instrument and join in, whether it be banjo, guitar, fiddle, or washboard! &nbsp;Experience the nostalgic charm of days gone by, and a true Appalachian heritage moment right in downtown West Jefferson! Pickin&#39; on a Porch is held every Tuesday in June, July and August at 2:00 pm. Mount Jefferson Presbyterian&#39;s front porch is located at 201 South Jefferson Avenue, West Jefferson, North Carolina. For more information, call 336-846-7481, email wjeffpres@skybest.com, or visit www.mjpc.org. We genuinely hope you enjoy your Appalachian musical heritage experience!